Hello! 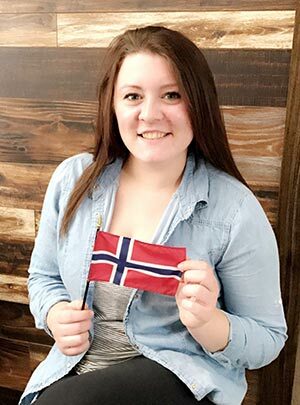 My name is Riley Flom and I’ve been selected to be a part of a very exciting opportunity; to represent the United States in Norway as part of the 2018 IFYE program! I will begin my journey June 14th and will be back to share what I have learned around September 13th. After hearing of all the amazing things other IFYE’s have experienced and how this program broadened their education, I knew that I needed to be a part of the IFYE program. I want to learn about agriculture in other parts of the world and there’s no better way to learn about something than to immerse yourself in it. Once I decided IFYE was something I genuinely wanted to do, I submitted my application and completed the interview process. After a few months of waiting, I received an email with a congratulatory letter saying I was accepted as a 2018 IFYE! It’s been such an exciting process so far, and I can’t wait to see what else is in store for me on this journey. As an IFYE to Norway, I will get to live day to day life with each host family. As my host family includes and welcomes me as their ‘daughter’, I will be able to participate and contribute to all facets of their family life and get to know everything I can about each host family’s culture and traditions. I am currently enrolled at North Dakota State College of Science in Wahpeton, North Dakota. I’m studying Crop Production and Animal Science with plans to graduate in December of 2019. On my days off from school and on the weekends, I work at our local Hornbacher’s grocery store. As you can imagine, being a full-time college student and meeting the demands of studying and homework, you can only fit in a limited number of hours to work without letting it affect your studies. That is why I am turning to supporters like you to help offset the $3,000 participation fee. Any monetary contribution would help tremendously, and upon my return, I would be more than happy to share my experiences with you, your organization or groups you might belong to. If you'd like to make a contribution to my upcoming journey, please visit my GoFundMe account: https://www.gofundme.com/riley-flom-ifye-participant. Thank you for your consideration. The IFYE Association of the USA, is a Premier International rural-based Exchange Program for young adults 19 years of age and older. IFYE is a 501(c)3 non-profit organization. The IFYE Association of the USA alumni and other donors contribute about 85% of the program costs. The $3,000 is the selected participants’ contribution for their 3 or 6-month experience with host families. Having met the requirements of the IFYE Association of the USA, Inc. Riley Flom is approved to create/use a GoFundMe account for fundraising.